Over the years, people have asked ma what type of foods she feeds us. For years we have ate Purina Pro Plan® SAVOR® Shredded Blend. 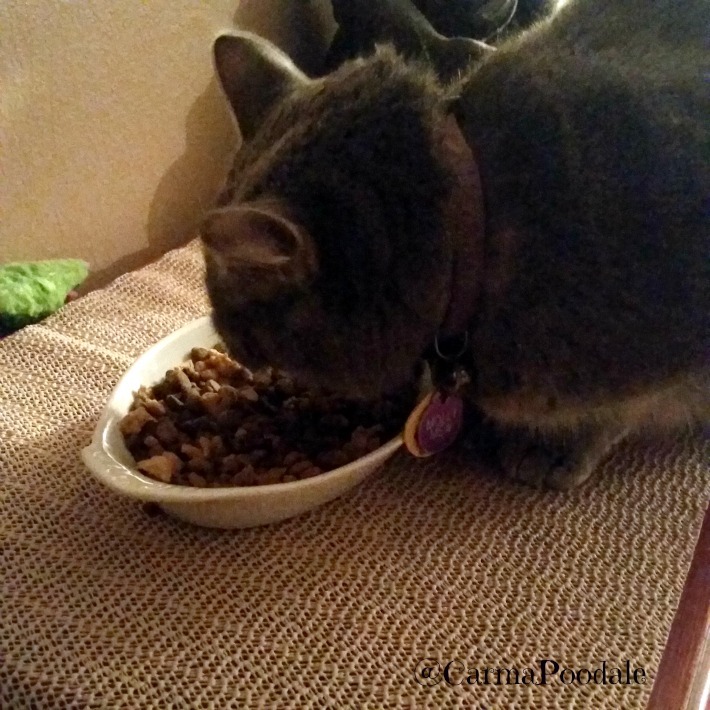 There is always Purina Pro Plan Savor Shredded Blend in our bowls for a quick snack but for our dinner ,ma started feeding us rare foods because she simply liked to cook for us. She has tried to get us to eat raw for about a year now but there is no way I am going to eat a piece of raw food. I want to watch her slice and dice, stir and serve. I even have my own skillet that is called the "poodle pan". Its a beautiful red skillet that when she has it in her hand, I know she is cooking for me. 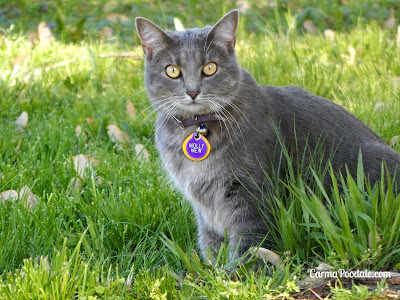 Molly Mew, our kitty on the other hand, is a true Purina Pro Plan girl. When Molly turned a year old ma wanted to get her a food that would support her growing body and energy level.We tried other brands. I don't think there is a brand out there that ma didn't buy. Every bag she bought, she donated to the humane society. One day ma caught Molly Mew eating the ProPlan out of Jenny Sue's bowl. She was eating the shredded pieces that was in the food. Ma bought a bag of the ProPlan chicken and rice for cats. The search for the right food was finally over! Molly LOVED her Purina ProPlan! She has been eating it for a year now. 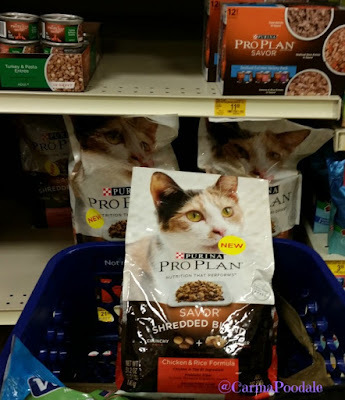 A few months ago we went to PetSmart to pick up a new bag and we seen they now had the Shredded ProPlan. Since Molly seemed to like the chicken chunks in Jenny's food, she thought maybe she would like her own chicken chunks. Molly dove into that bag like it was caviar. For the last few months Molly has been eating the Purina Pro Plan® SAVOR® Shredded Blend. Molly Mew eats her tuna as her snacks during the day but don't mess with her ProPlan bowl. Ma has to let her eat all her ProPlan out of the bowl till its gone just so she can wash the bowl. When Molly Mew sees that bowl missing, she gets VERY vocal. Ma tries to wash it as fast as she can. The 1st ingredient is CHICKEN. Molly loves the taste and doesn't overeat.She stays at a healthy weight. It supports Molly's energy level. We refer to Molly as a Ky Wildcat. She loves to play. She loves to run and she loves to cuddle. It is reasonably priced. It is a high quality food that doesn't break the bank. Purina Pro Plan® SAVOR® provides the nutrition they need and a taste they'll love, without compromise. Molly's cat box does NOT stink! That is right. No horrible smells. Ma scoops it once a day. No magic litter, no holding your nose. We have had company ask us how we keep the litter box fresh. If your cat has stinky pooh, you are feeding the wrong food. Now I know some of you are going to say that this food also has corn gluten in it. Did you know that corn gluten is highly digestible, has a great amino acid profile, and is considered to be similar in quality to fish meal? Cats in the wild don't eat corn! Hmm, lets think about this.... Cats in the wild eat mice, rabbits, birds,etc. right? 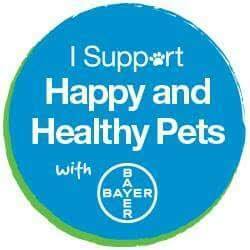 What do you think those mice, rabbits, birds, etc eat? When a cat eats their prey, they are also eating whatever their prey has eaten. More than likely, it is grains and corn. We have a feral cat that visits our backyard. Ma watches that cat like a hawk :). She watches what that cat eats and how that cat acts. Ma seen a vole by the bird feeder eating the corn that had fell on the ground. A little later ma seen that feral cat catch that vole and eat it. That cat just ate CORN filled vole! Molly Mew isn't a feral cat. She is a sweet, lovable, energetic like a kitten, ball of love. She deserves to be fed right and enjoy the food that she eats. PetSmart right now has displays up of the ProPlan Savor Shredded Blends. You can see what the food looks like in person. The photo above is of Molly Mew's bowl and bag. You can see the tender pieces of chickyum, oops, chicken in the bowl. Molly Mew loves her ProPlan. Ma has even thought she would be sneaky and add another food in to see if Molly would eat it. Molly would eat all her ProPlan but leave the other food in the bowl or throw it off the table so I could eat it. #trueStory! The above photo is of Molly Mew having a nightly snack before we go to bed. Tomorrow she will empty her bowl. Being a ninja kitty , she needs her nutrition and she gets it with her Purina ProPlan. Are you are wondering about the dog ProPlan? I know that ma still recommends it to people who are looking for a quality food. I have heard her tell many people in PetSmart the reasons she fed it to us. She also ask people to donate it to our humane society to give the dogs a great start on life. 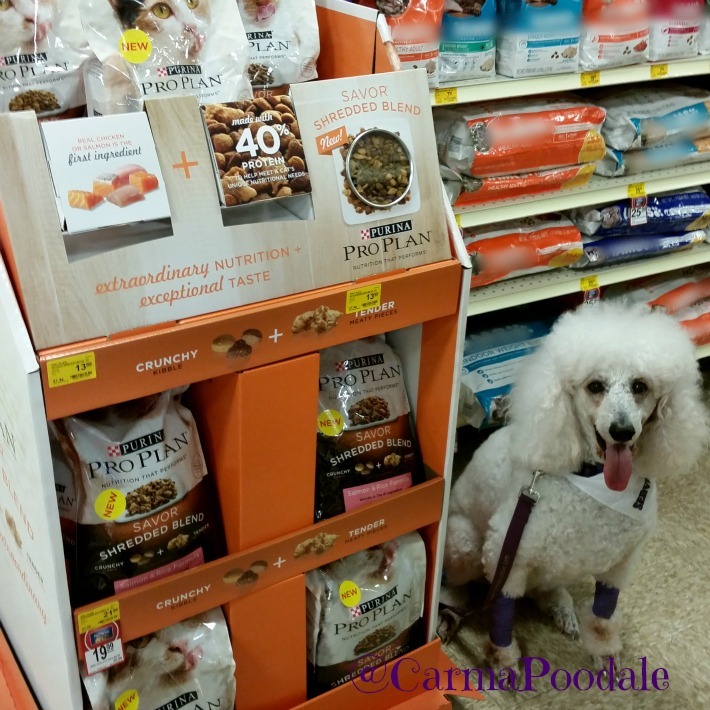 Did you know my friend , London the Standard Poodle, ate ProPlan? He has 100 BIS (Best In Show) and was the World Champion of 2012. Yep, he is a ProPlan boy. It was actually London's owners who recommended the ProPlan to us. Many of the winners of the National dog show are ProPlan dogs. 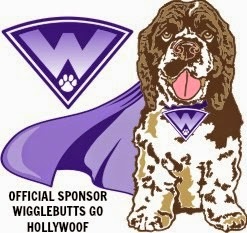 Now if it is good enough for show dogs, its good enough for your "best in show"dog. Follow Purina ProPlan on the following social channels. I know I do! If you don't know which formula you should buy, you can visit the ProPlan Website. Tell them a little about your dog and you can get a $5.00 off a bag coupon. Want to know more about the ProPlan for cats? They have a website for that too! Read articles about cat health, watch a video about ProPlan Shredded and more. 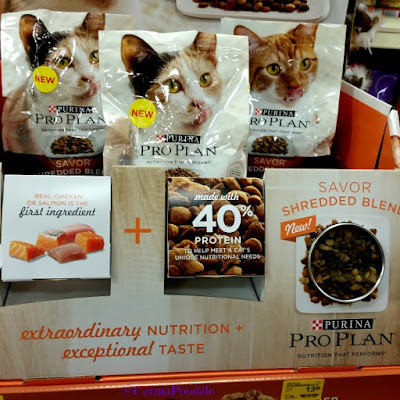 Purina ProPlan Cat. 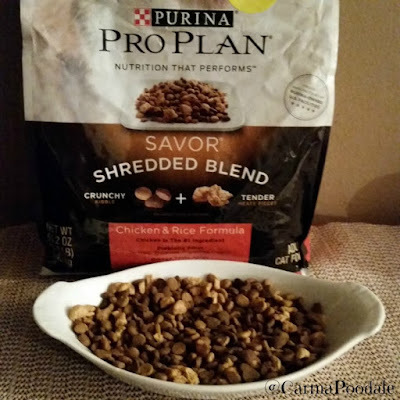 Would you try Purina ProPlan? I think your Molly Mew and my Mudpie would be great friends...Mudpie is 100% a Pro Plan girl too! When I adopted her 3 months ago I got so exasperated trying to find food that she would consistently like, and the minute she dove into a bowl of Pro Plan I knew I'd found the one! For wet food she eats Sheba trays, but her Pro Plan dry food is still her favorite. That is wonderful that Mudpie is also a proplan girl. Molly used to eat the Sheba trays too but she gave them up when we introduced real tuna to her. I really wish she would eat the ProPlan wet but she will just lik the juice off and nothing else. Our 3 kitties can't wait to try the Shredded Blend ! My neighbor adopted a cat recently and I am sharing this with her so she can get her kitty on this fab food!